Elizabeth Warren spoke in Lawrence Saturday. LAWRENCE — In her first appearances of the 2020 campaign last month, Senator Elizabeth Warren often opened with a story about her mother back in Oklahoma putting on her nicest dress to get a minimum wage job and keep the family afloat after her father fell ill. 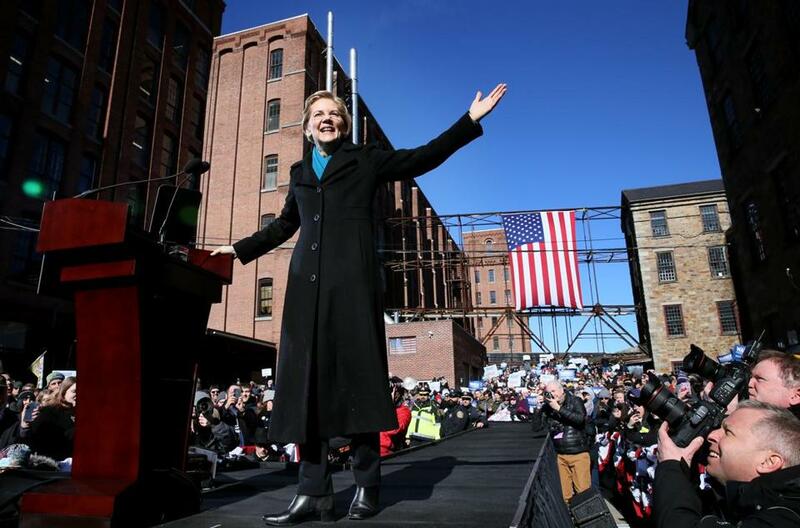 But on Saturday, when Warren made her presidential candidacy official in this industrial city, she told an older story, of the immigrant workers who toiled in squalid, deadly conditions in the old textile mills around her, and who launched the Bread and Roses strike of 1912 that ultimately led to higher wages and improved conditions. After a week in which she was again haunted by her claims to Native American heritage, the Lawrence event was a moment for Warren to define her candidacy. And she went big, presenting her longtime focus on inequality as a universal concern that connects the women and immigrants from a century ago with the sprawling coalition of Democratic voters today. She hit on many of the policy ideas animating Democrats, such as Medicare for All and the Green New Deal, and forcefully called out racial discrimination for holding back minority families. And she sought to present her message as unifying and inclusive, particularly for core Democratic blocs that she is trying to assemble into a broad front against the wealthy and powerful who have “paid off politicians to tilt the system just a little more in their direction” year after year. 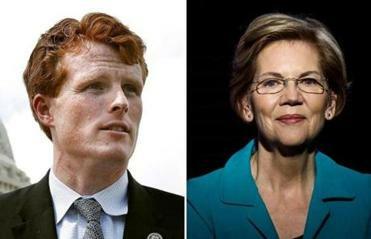 It’s a high-profile endorsement for Senator Elizabeth Warren at a time when the vast majority of big name Democrats are hanging back and waiting to see how the ever-expanding field shakes out. Leah Rapperport and Janet Cho attended Warren’s kick-off. Warren called for “big, structural change,” and said President Trump was a symptom, not a cause, of problems in the country. But there is a question of whether her expansive call will appeal to Democrats laser-focused on beating Trump. 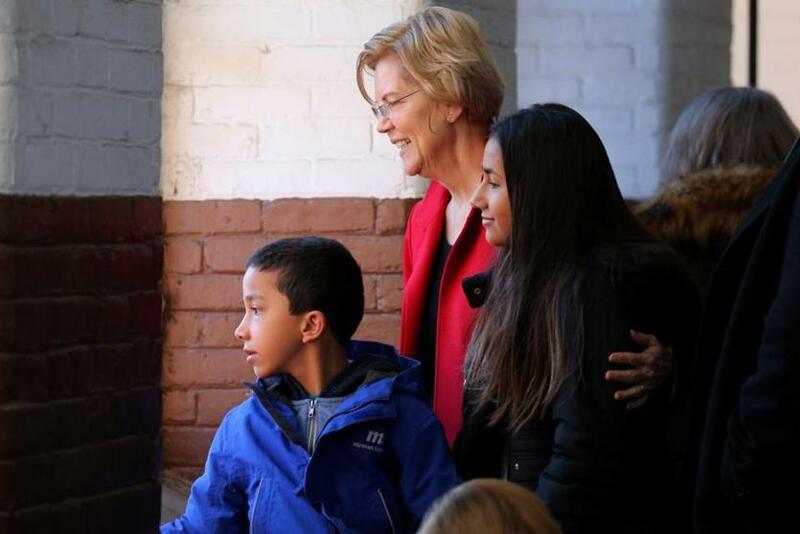 “We need candidates who can appeal to the majority of the country,” said Tracy Schroeder, 63, who went to see Warren at her second stop Saturday, in Dover, N.H. Schroeder said she was worried the Native American controversy would damage Warren’s electability. But after hearing her in Dover, Schroeder said she was encouraged by Warren’s optimistic vision. 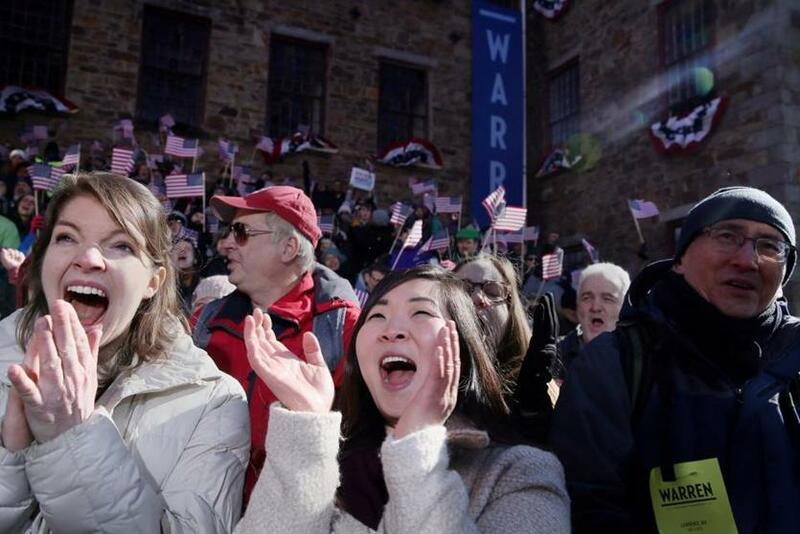 The announcement kicked off a seven-state tour for Warren, whose already muscular campaign operation has drawn droves of enthusiastic voters and established her as a top-tier candidate in a deep field. And Trump himself greeted her speech with a tweet late Saturday in which he again referred to Warren as Pocahontas. 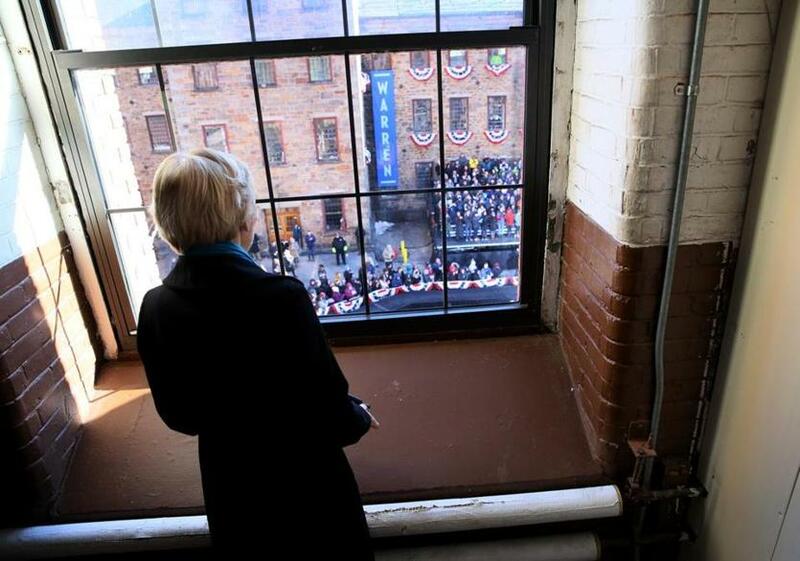 Warren looked over the crowd before officially announcing her run for the presidency. Oscar Burgos, 18, said he admired Warren for standing up to Trump. Other candidates have also generated intense enthusiasm among voters. Senator Kamala Harris of California drew 22,000 people to her announcement in Oakland in January and raised $1.5 million in her first day as a declared candidate. Big names waiting in the wings include former vice president Joe Biden and former Texas congressman Beto O’Rourke. And Bernie Sanders, the independent Vermont senator who in 2016 ran an insurgent campaign on populist themes similar to Warren, could also siphon off support for her if he runs. Some who saw Warren in Lawrence were still perusing the buffet of candidates. To John Mara, 64, Warren represented the Democrats’ drift to the left. “I want to see what lane she carves out for herself and if it can be successful,” Mara said, adding that he liked Biden more. 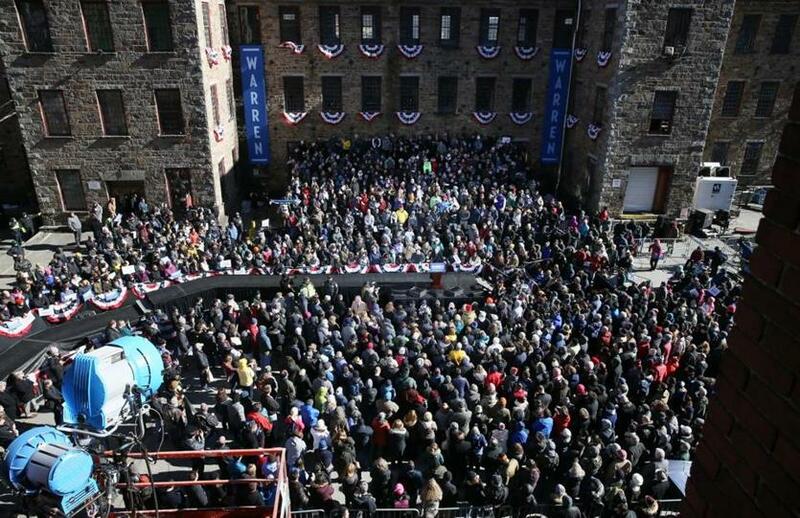 The event was at Everett Mills in Lawrence. homeownership rates, death rates in the Lawrence mills — with a full-throated call for new economic rules. “She’s bringing the message directly to us, the working people, to immigrants she’s trying to include everybody, black, white, poor,” Jiminian said. In her speech, Warren blamed corruption for Washington gridlock on issues such as climate change and gun control. She drew on personal accomplishments, from potty-training her daughter to creating the Consumer Financial Protection Bureau, to make her case as the champion of sweeping reform, including new restrictions on lobbyists, limitations on banks, rules to empower workers, and protections of voting rights. And in the end, she compared her efforts to those of the women in the Lawrence mill who a century ago also embarked on an uncertain campaign of protest. Warren looked at the crowd with her grandchildren, Atticus and Lavinia Tyagi. Jess Bidgood can be reached at Jess.Bidgood@globe.com. Follow her on Twitter @jessbidgood. Victoria McGrane can be reached at victoria.mcgrane@globe.com. Follow her on Twitter @vgmac.